47 days before our keys are handed over. We are sort of panicking a bit. We have been in our existing house for nearly 36 years and consequently have a lot of junk that has to be sorted though. We have removed everything from our roof space and I am slowly going through it all. This is very slow, as things are so dusty that my sinuses play up and I get a really bad headache. But I have huge piles of books, children’s clothes and toys to give away. What a really good feeling. Doing under the house and the garage will be a huge task as well, but that will be mainly Martin’s job. There has been quite a bit of progress. 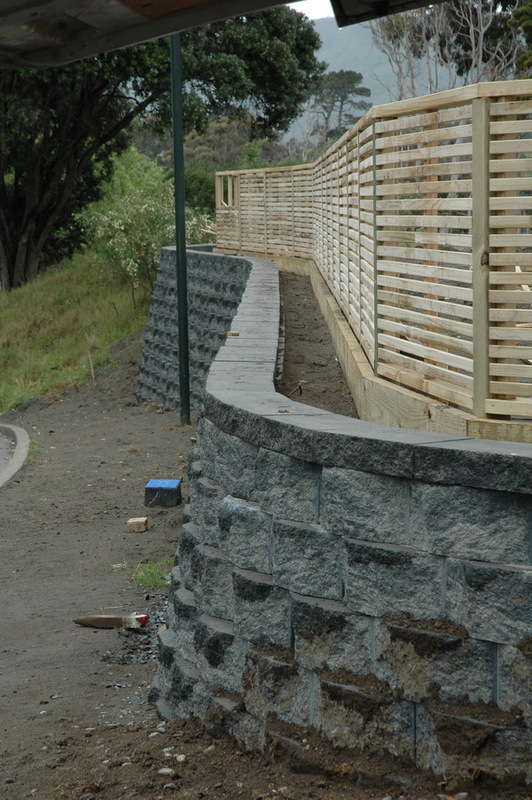 We now have a completed retaining wall, including a fence on top. 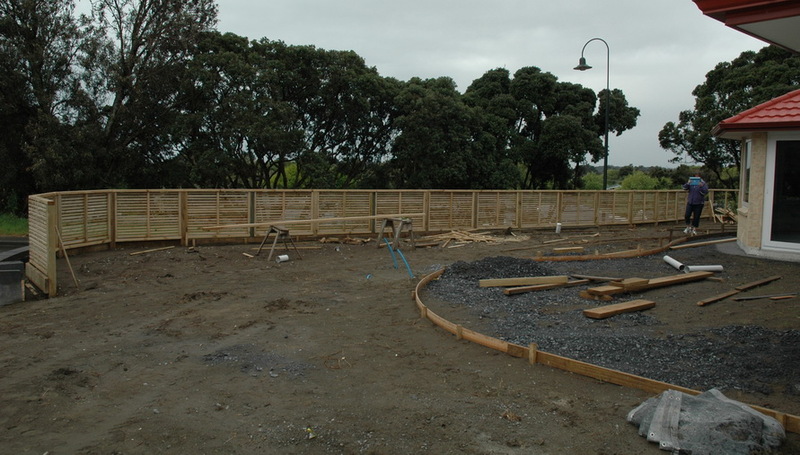 The fence on top is not quite finished and as you can see it is not right up to the retaining wall. It had to be 600mm from the outside edge of the wall. Quite annoying as it is a huge waste of space and of course any garden we put there will be hard to look after. I am pretty sure we will have weed cloth and then stones on top with holes to plant small bushes etc. The garden there will be raised so it comes to just under the top of the wall. There is then a step up to the other side. The slab of wood you see at the bottom of the fence is actually a tiny retaining wall. On the other side we are having a 150mm mowing strip along most of the fence where we are not having a garden. There will be a small garden at this end of the fence on the house side, with a mowing strip in front of it. This mowing strips will also have paua in them like the patios. We now have a path all along the back of the house and out to the clothes line. The second photo shows Harper clowning around hanging out the window. We will be having a concrete pad for the under floor heat pump unit to the left of the path and a small garden for a passion fruit vine then a large concrete pad where we will park our trailer. In our Wainuiomata house 40 years ago we had a wonderful passion fruit vine and it was surrounded with concrete, so we are hoping that is the way to go. The vines obviously like the heat generated by all that concrete. 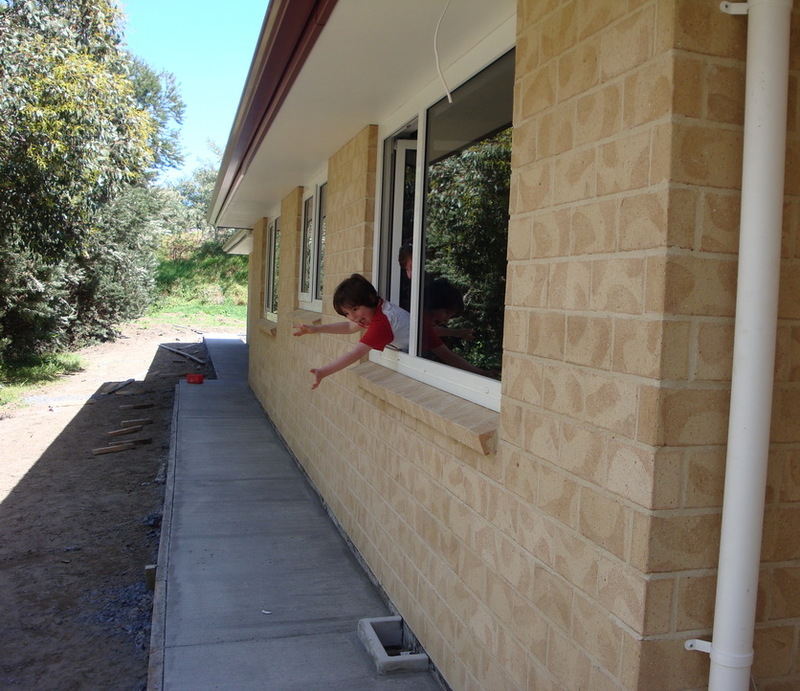 Our grandchildren are very interested in going up to our new house. They have already sorted out where they will sleep. Harper has decided he will sleep in our walk in wardrobe! He has got to an age where he wants his own bedroom and this is a way of getting that if just for the time they stay with us. 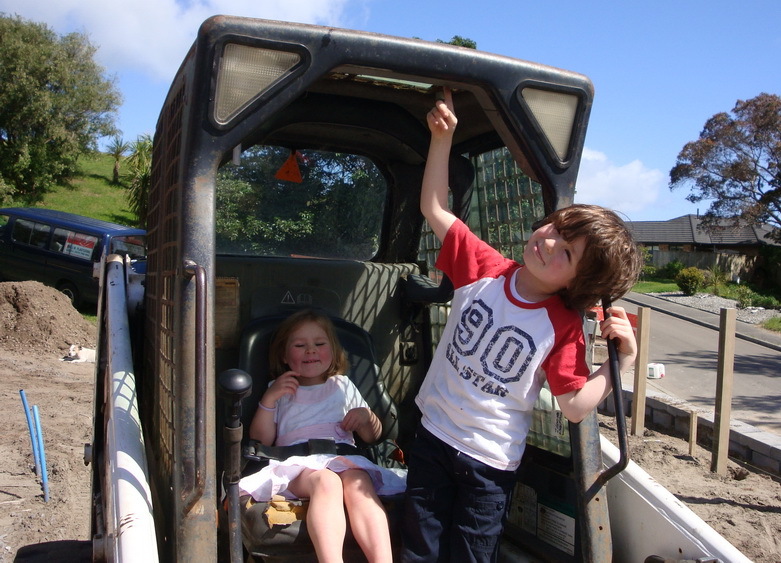 Harper and Millie are now on the Bob Cat. This time we were able to ask if they could do this. Our landscaper had no problem at all with them climbing on board. Harper even noticed that the key was still in the ignition, but knew better than to turn it on! We were told that it took more than just turning it on anyway. 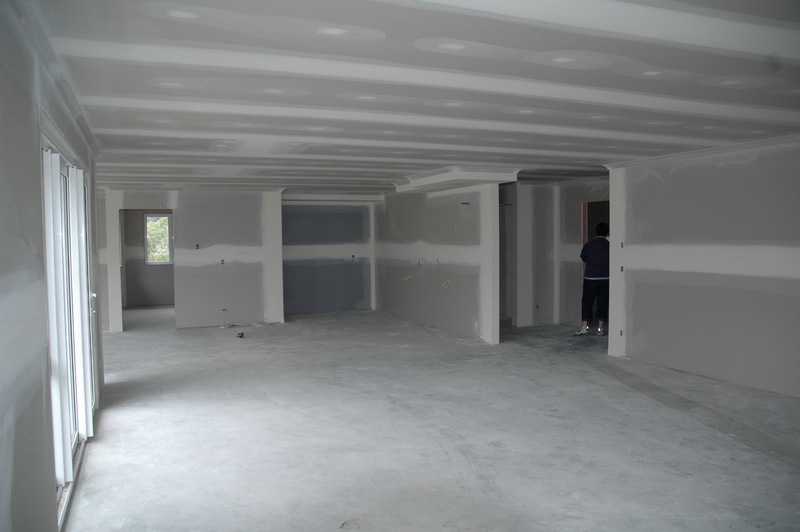 This is the family room looking towards the kitchen and the formal lounge around to the right. Elizabeth is standing in the hall besides her bedroom. It will look rather different when the kitchen is installed. 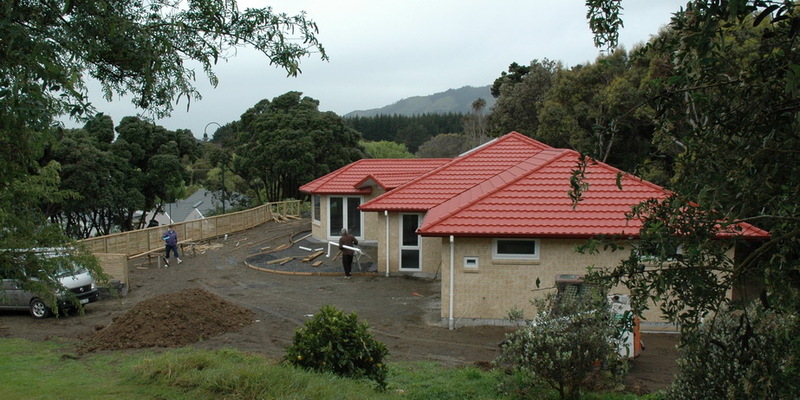 This is a view of the house from the section next door. You can sort of see where the patio is marked out. At the widest it will be 6 metres. Another view of the fence and patio. I think the patio is going to be laid tomorrow. There was a hold up because of drainage. That was one of the reasons we had to go up there the second time last week. 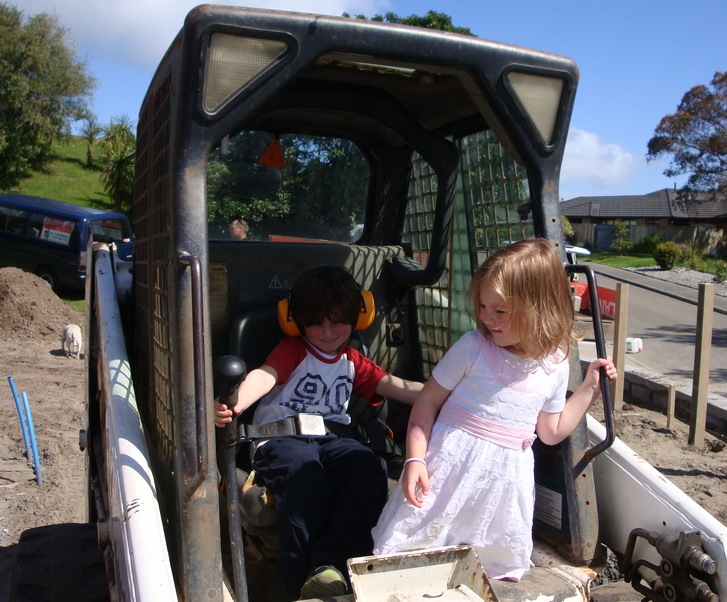 We had to meet the plumber, landscaper and an engineer on site. Evidently on the plans the drainage grids were put in the wrong place for the Kapiti Coast. All is now sorted. All rain that falls on our property has to stay on our property and not go into the drains in the street. So we have a couple of soak pits. I don’t actually understand totally how they work! At the moment we don’t have any plans for going up there next week. 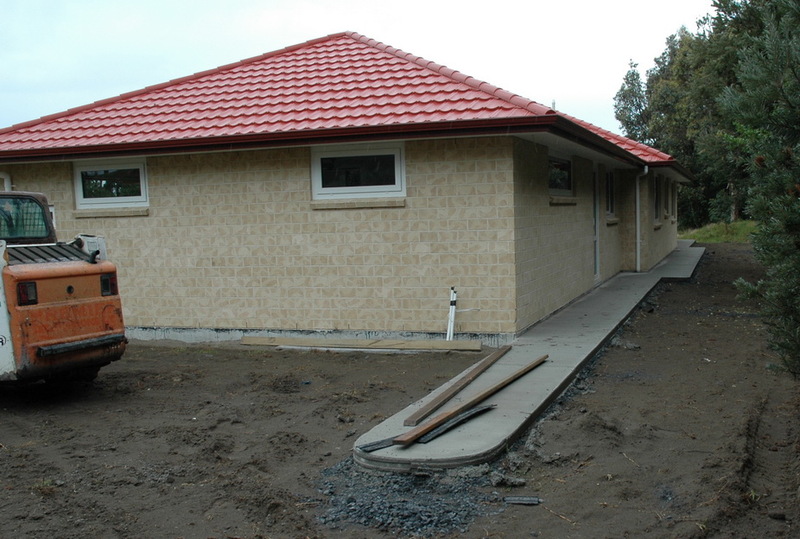 But that is good, as we can go when we want to and not when we have to meet any contractors. This entry was posted in house build by catemanning45. Bookmark the permalink. What is happening?have you moved yet?